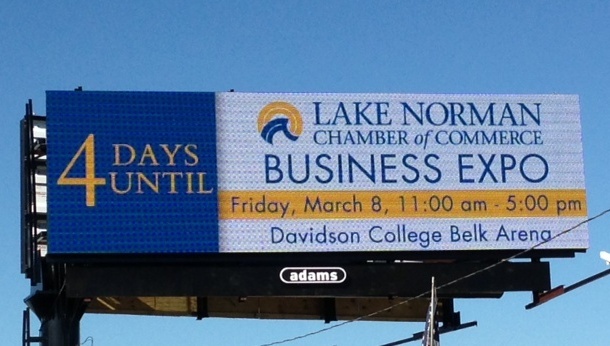 The Lake Norman Chamber’s signature event, the 2013 Business Expo, will be held Friday, March 8th at the Davidson College Belk Arena from 11 am until 5 pm. The Expo is presented by Lake Norman Chrysler Dodge Jeep Ram and Randy Marion Automotive. Gold Sponsors include Lake Norman Magazine, MI Connection, and Presbyterian Hospital Huntersville. Silver Sponsors are The Herald Weekly, Carolinas Healthcare System, and Piedmont Natural Gas. Admission is free and the public is encouraged to attend. A full listing of sponsors can be found in this newsletter and on the Chamber’s website. To encourage public participation, KS Audio Video in Cornelius has donated a 39″ Hisense Flat Panel 1080p LCD television. Guests will be encouraged to play Chamber BINGO visiting exhibitor’s booths for a chance to win. This year, it will not require signatures from the vendors but contestants will still have to visit the booths! More than 2,000 people are expected to attend with approximately 130 businesses and 20 non-profits exhibited in what has become the Charlotte region’s largest business trade show. Lunch will be provided by three Lake Norman restaurants: Alton’s Kitchen and Cocktails, Fox and the Hound Birkdale, and the Honey Baked Ham Company & Café will serve meals for $8 including beverage. Tickets can be purchased at the Expo or in advance at the Chamber. The restaurant menu can be found at www.lakenormanchamber.org. Bill Russell, president of the Chamber said, “The Business Expo, now in its twelfth year, is an excellent opportunity for local businesses and non-profits to showcase their products, services, and organizations to the community. It has also become a tremendous networking opportunity as we re-establish old friendships and create new relationships. For a complete listing of sponsors and exhibitors, directions, and other information see the Expo website at www.lakenormanchamber.org or call the Chamber for more information at 704-892-1922.